Bangkok (the meaning of Bangkok is “Village of the Wild Plum”) is the center of nearly everything: of power, education, commerce, communication, and fun. It is said, both metaphorically and literally, that all roads (in Thailand) lead to Bangkok. Originally, Ayutthaya was the Thai capital. After 400 years of ruling there, it was destroyed in 1767. Next, the capital was moved to Thonburi, but in 1782, King Rama I decided to move it to Bangkok, which was, at that time, only a small trading port. He felt that this area had the proper space and for the capital and was more easily defensible. Early on, Bangkok was “a water-oriented city”. The river and canals were the main forms of communication. However, in 1862, “a proper street appeared”. Soon, roads began to increase in number, starting from the Chao Phraya. Inspired by his travels, King Rama V wished to make Bangkok more European-styled, including “broad, tree-lined avenues and parks”. However, Bangkok did not allow for this “systematic planning”. In the 1950’s, buildings began popping up everywhere in the capital and, to this day, it is hardly recognizable to elder Thai people. Today, Bangkok is an area about 600 miles large, on both sides of the river. About ten million people reside there, half of which are under age thirty. They commute several hours to work each day mainly by bus. However, there is now a system, not unlike the subway (which they also have), and it is a “Sky train”. Do you see the Buddah there, up high in the center? The Grand Palace is a main site-seeing attraction. “It has been the center of every capital in the country’s history”. It is surrounded by a tall wall and covers and entire mile. Inside this grand Palace was an Inner Palace. It was like a complete town to itself and was ruled by women. Only some men were permitted to enter (doctors, construction workers, the King’s sons, until they reached puberty, and the king himself). In another area of the Grand Palace there is a building called the “Audience Hall”. In it are many European-styled paintings and a “splendid wooden throne plated with silver and gold niello”. This part was frequently used to greet foreign ambassadors. Next to this Grand Palace are several temples. In one of them, the Wat Phra Keo, a statue of Buddha (26 in. high, 19 in. wide, made from a semiprecious kind of jade) sits on a tall throne, encased in glass. It is known as “The Emerald Buddha”. Along the walls and ceiling of this temple are many beautiful pictures, painted onto them. Not far from this area of temples and the Grand Palace, is another temple-filled area. Here, the main attraction is the Reclining Buddha. This piece of art is in a narrow building, a few feet on either side and just tall enough for the Buddha’s tall, pointy hat to fit. The Buddha statue itself is 150 ft long and 50 ft high! On it’s feet are legendary signs and stories of the Buddha. This statue is covered with “layers of gold leaf” and “represents the Buddha dying at the moment he entered Nirvana”. It is quite impressive. 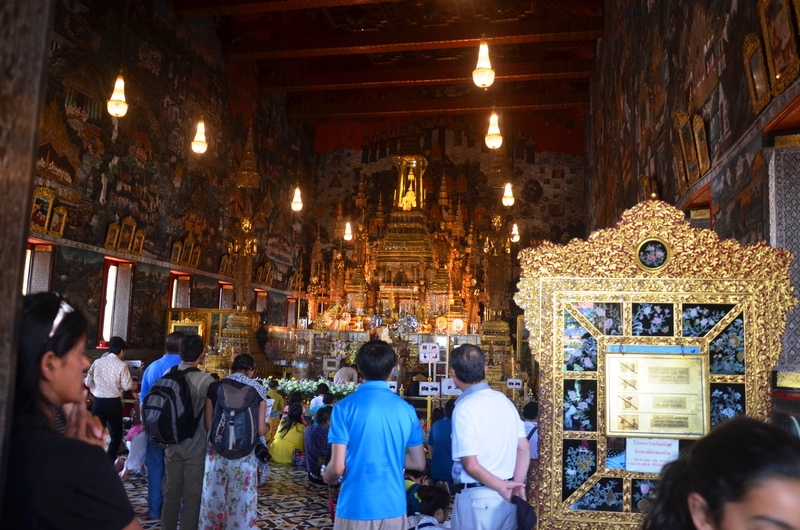 My family and I visited The Grand Palace, the temples beside it, and The Reclining Buddha. It was very interesting seeing all the unique Asian art and styles used in creating these buildings. I loved the shininess of all the gold and the sun reflecting on it. And seeing the size of the Reclining Buddha was quite impressive. However, it was a bit sad to see that all this gold, money, time, and designing was used to create something for the mere image of Buddha. It is a cool site but admission fees (to the Grand palace/temples) is about $15 (450 b) (for both adult and child). The fee to The Reclining Buddha was about $3 USD (100 b). I’d say it is worth it to go, just to see! I think you would be disappointed if you ended up leaving Thailand without seeing it.